Kangana had organised a special screening of the movie for Sadhguru. 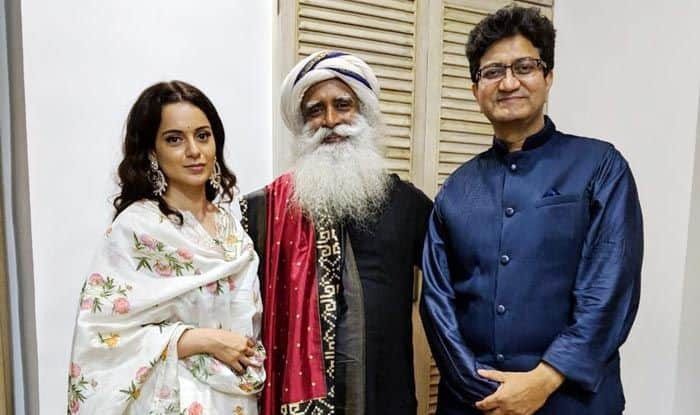 After facing much flak from fringe outfits for her movie Manikarnika: The Queen of Jhansi, actress-director Kangana Ranaut met with yogi Sadhguru Jaggi Vasudev, and posed for a picture with him along with screenwriter, lyricist Prasoon Joshi. Sadhguru shared the picture on his Twitter page along with a message that was full of praise for the movie. Manikarnika: The Queen Of Jhansi captures the life story of Rani Laxmibai and her fight against the British. Kangana plays the lead role in the film, produced by Zee Studios in association with Kamal Jain and Nishant Pitti. According to reports, the Maharashtra wing of the Karni Sena protested against the film on Thursday alleging that the period drama “alludes to Rani Laxmibai’s relationship with a British officer”. The reports also said Karni Sena is opposed to the film showing the queen dancing to a special number, saying it is against tradition. They asked the makers of the film to show them the movie before its release on January 25, 2019. The outfit’s president, Ajay Singh Sengar, had also threatened to burn the film sets and ruin Kangana’s career if the movie in any way insulted the Queen of Jhansi.